Intensive, pigment-enriched treatments that create new bonds and retain blonde colour. 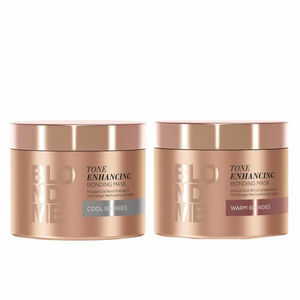 Schwarzkopf Professional's BLONDME Tone Enhancing Bonding Masks create new bonds within the hair fibres, make porous hair easier to brush and repair the hair's internal structure. The COOL BLONDES Mask is a light, pigment-enriched intensive treatment with cool ash tone shading. It delivers cool pigments to maintain, refresh and enrich blonde tone directions. It also neutralises any blonde tones that have a tendency to turn warm and visually brightens highlighted blonde hair. The WARM BLONDES Mask is an intensive pigment-enriched treatment that contains naturally warm colour pigments to refresh warm blonde and dull, washed out blonde tones. It also delivers moisture and creates a healthy shine. Contains moisturising Panthenol to balance the hair’s natural water content. Both Enhancing Masks come in a 200-ml pot.